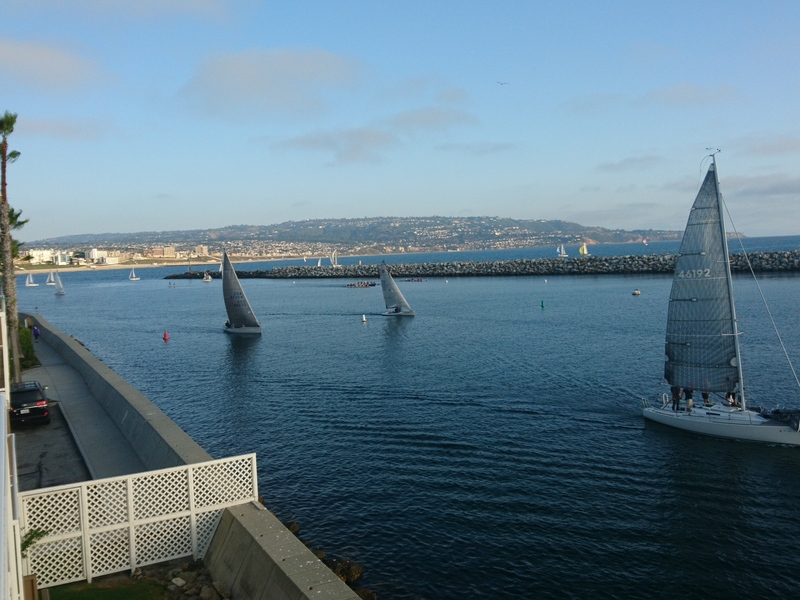 My parents offered to watch the kids for a few days, so my husband and I took the opportunity for a little nearby getaway, and absconded to Redondo Beach for a lovely July weekend. We started our getaway with lunch at one of our favorite North County restaurants, Trattoria i Trulli, along S. Coast Blvd in Encinitas. I love the crushed tomato topping/dip for the bread (which is always fresh and warm and delicious), and I’ve never had an entree that has disappointed me. After lunch, we decided to make the drive leisurely, and stayed on the Coast Road instead of heading for the 5 freeway. We’ve driven this road many times, but I always enjoy it. Parts of the drive have beautiful ocean views, during other parts I enjoy looking at the local shops and restaurants along the road. Once we got to Redondo Beach, we headed straight for our hotel, The Portofino Hotel. We had decided to splurge on an upper level ocean view room, and we weren’t disappointed. 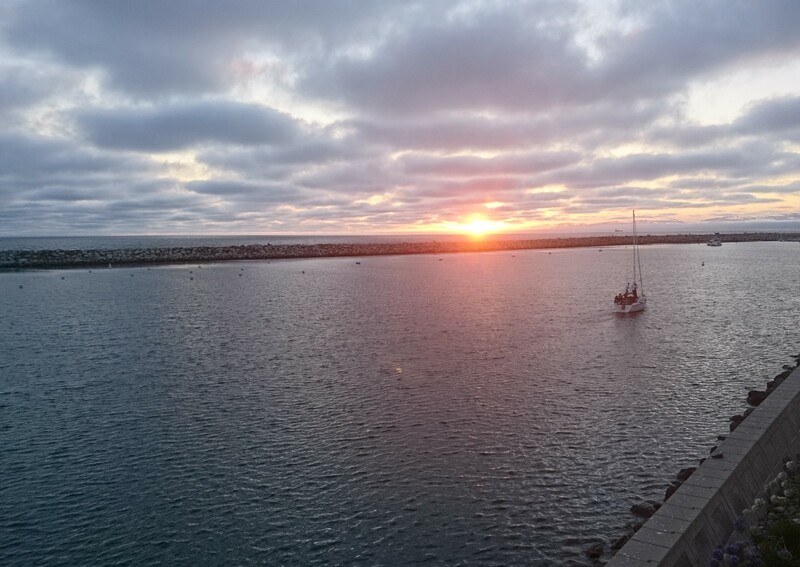 We settled in, and then walked over to the nearby Redondo Pier for dinner. There was a free summer concert on, so we watched that for a little while first, then settled on A Basq Kitchen for dinner. It was paella night, so we had a small order of that and several tapas. We didn’t agree on our favorite dishes – mine were the Croquetas de Jamon and the Potatoes Bravas, my husband preferred the Shrimp Pintxo – but we agreed it was delicious. The next day, we decided to take a long walk along the beach. We started with breakfast, of course. When searching for nearby coffee options, my husband found The Boy and the Bear, and after reading the rave reviews about their cappuccino, he decided he had to try it. So we started our day with a cappuccino (him), a tea (me), and pastries. He says the cappuccino lived up to the rave reviews. 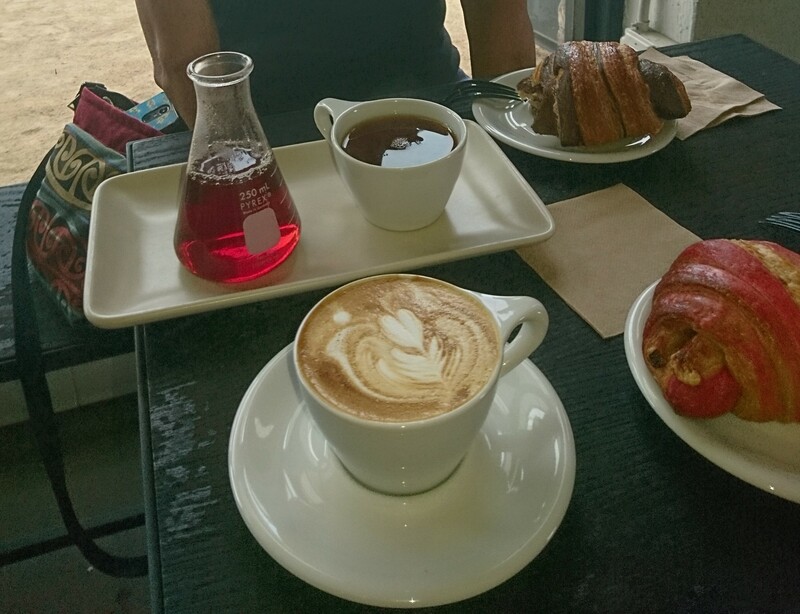 The tea was pretty good, and I was amused by the Erlenmeyer flask in which it was served. After breakfast, we walked to the beach, and then we walked on the beach as far as we could go, which was to the rocks at Malaga Cove. We walked up to the road when we got there, to admire the view. 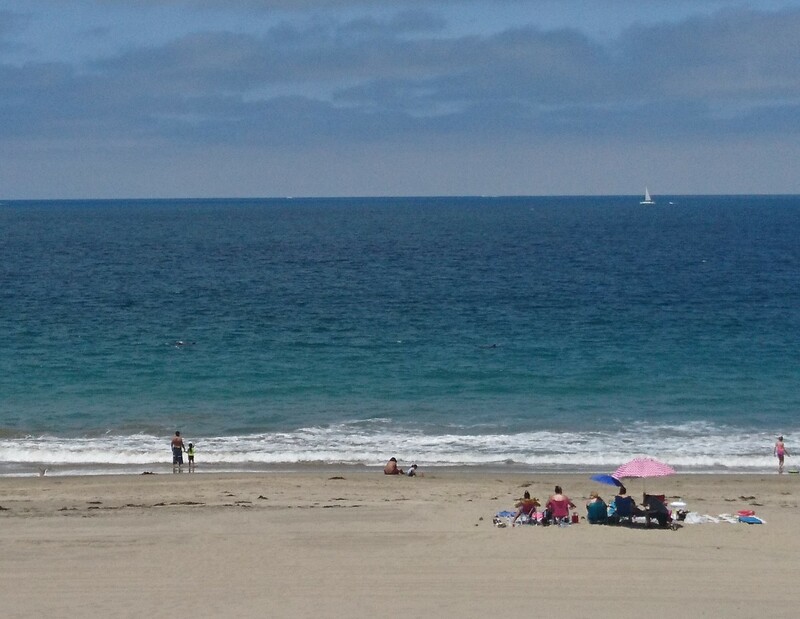 The stretch of beach that is Torrance Beach was particularly nice. The water was turquoise and there were dolphins playing just out past the break. In fact, we saw a rough water swimmer come pretty much nose to nose with a dolphin! I imagine that was unbelievably cool, but also a bit startling. White sand, turquoise water… and, if you look closely, two dolphins, right where the water turns deeper blue. We considered walking on the roads back to Redondo Beach from Malaga Cove, but decided that the beach would be a more pleasant walk. So we reversed course, but headed inland once we got back to Torrance Beach, and went for lunch in the little cluster of shops and restaurants near there. Lunch was at The Redondo Beach Brew Company, which was pleasant. We had thought we might go kayaking in the afternoon, and enjoy the late afternoon sun we’d appreciated when we arrived the day before. Sadly, the kayak rental shop closed too early to allow for that, so instead we lounged in our room and watched the sunset from our balcony. After sunset, we strolled back over to the pier area, and had dinner at the R/10 Social House. My husband raved about his steak. I can’t remember what I had, so it clearly wasn’t as memorable as the steak… but I do remember that women at both of the tables between us and the windows dropped their phones into their food while attempting to take a picture of their plates. I felt very vindicated in my general preference not to take pictures of my food! The next morning, we got our kayak outing. There is a rental place at the end of the point on which the hotel sits. From there, we paddled around the inlet in front of our hotel, and over to the main harbor by the pier. We got a close up view of the seals that hang out on a jetty in the inlet in front of the hotel, and we saw some fish. It was a nice paddle. 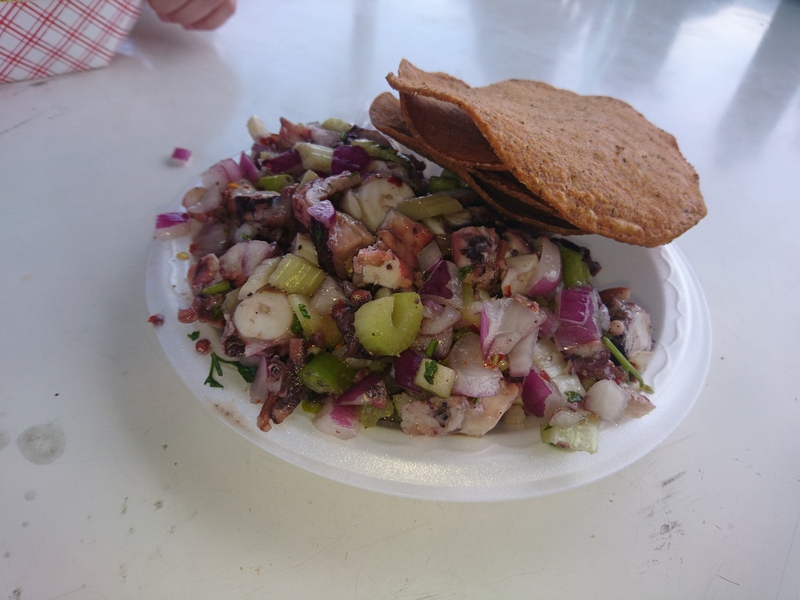 My husband’s octopus ceviche. He took the picture. After lunch, we dropped in on CRAFTED at the Port of Los Angeles, a weekend market that I’d been unable to find on our previous visit. This time, Google Maps led us right to it. It is a big old warehouse that has been refurbished to house stalls from local artists and vendors. It was nice to stroll around, and we bought some jam to bring back to thank my parents for watching the kids. It was an altogether excellent getaway – if you enjoy waterfront hotels, paddling on calm water, and long beach walks, it is a great option.